Do you love chicken tortilla soup? Is a great chicken tortilla soup, it’s full of vegetables, and chicken breast. If you are looking for a light chicken soup, this is the one for you. Chicken tortilla soup is one of the best soups around. It’s a chicken soup that is full of flavor. This chicken tortilla soup is rather unique. It is packed full of white chicken meat, and fresh vegetables. If you are looking for a light soup, this is the one for you. If you are lucky to live in the Los Angeles area, you may be familiar with the El Torito restaurants. Outstanding food and they strive to give each guest a wonderful experience, it’s hard not to love this restaurant. Tableside preparation of many of their most-loved dishes makes for a fun evening. A lot of chicken tortilla soup is rather bland and does not have a lot it in. This soup is perfect because it has fresh zucchini, squash, carrots, potatoes, and more. I love that this soup is really packed full of fresh vegetables. It also has fresh cilantro and fresh mint to give this a brightness to the soup. This much-loved soup, may have had its origin in Mexico City. Like many other dishes, as this dish made it’s way north from Mexico the soup changed a bit. Near Mexico City, the soup was a chicken soup, with no tomatoes, It always contained chicken and tortillas, but in California, tomatoes and beans can be found in the soup. No matter if you have the original style of soup, or one that was developed later, you are going to sink your soup into a bowl of delicious soup. For me, soups that have a Tex-Mex or inspiration from Mexico means that you have a variety of options for toppings. Here are some of my favorite toppings. 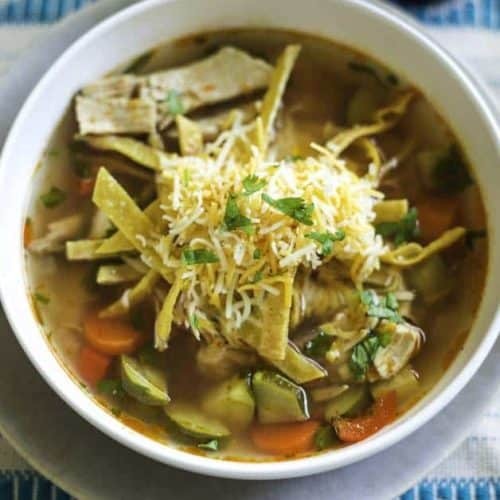 Want to find more chicken tortilla soups? 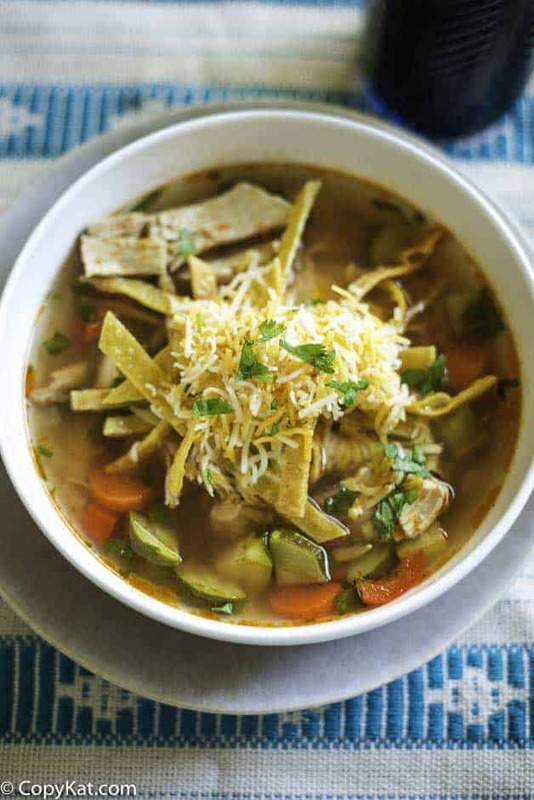 Be sure to check out these chicken tortilla soup recipes. El Tortito’s Tortilla Soup is from El Torito Mexican restaurant, Los Angeles, CA. Source Los Angeles Times 12-26-96. 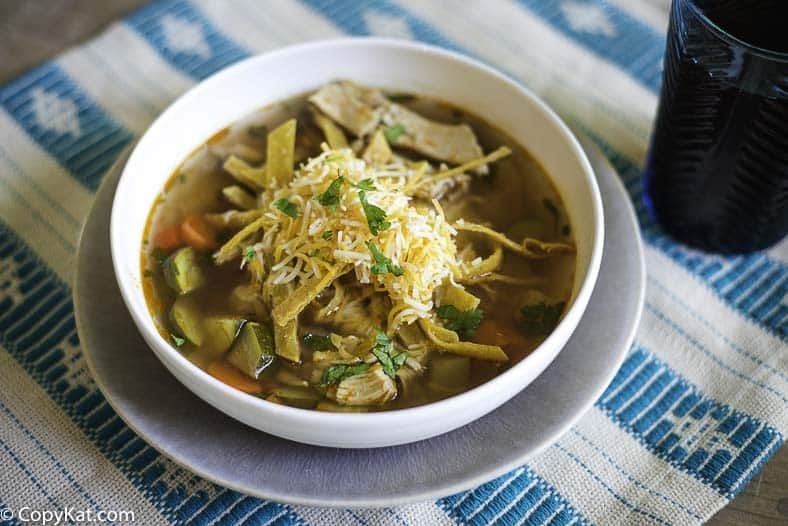 Make El Torito's Tortilla Soup at home with this recipe. Poach chicken breast in simmering chicken broth until done through, about 10 minutes. Set aside until cool enough to handle and shred. Combine chicken broth, chicken, red onion, carrots, potato, tomato paste, bay leaf, garlic, chipotle and jalapeno chilies, oregano, cumin and salt and pepper in large saucepan. Bring to boil, reduce heat and simmer 20 minutes. Correct seasoning, if necessary. Add zucchini, squash, pepper, lime juice and Sherry. Bring again to boil. Reduce heat and simmer 15 minutes. Add cilantro and mint. Stir, then remove from heat. To assemble, fry tortilla strips in hot oil until crisp. Drain on paper towels and set aside. Ladle soup into each bowl. Sprinkle with shredded cheese and tortilla strips. Garnish each bowl with avocado slice and sprig cilantro. Serve at once. try this for cool weather meal – substitute maggi Caldo Sabor Pollo for broth, omit mint. Looking for Crackers and Company Cafe’s Chicken Tortilla Soup — absolutely delicious! This soup is amazing!! I’ve never had the one at ‘el torito’..and I was trying to find the one at ‘el torito grill’..it tastes so similar. Has a hint of lime and the ingredients are delicious!! I used about half of everything on this recipe to make a smaller serving and it was still enough to feed five adults!! It’s become a family favorite..love love love it!! I am glad you like the soup! This is THE BEST tortilla soup recipe I have ever tried. Don’t be tempted to subtitute pre-made tortilla chips in the place of fried tortilla strips, you’d be selling the dish short 🙂 AMAZING recipe, a family and co-worker favorite. Thanks!